, an Italian botanist of great celebrity, particularly in what is now called the cryptogamic department, was born at Florence, December 11, 1679. His parents were indigent, and took but little care of his education. 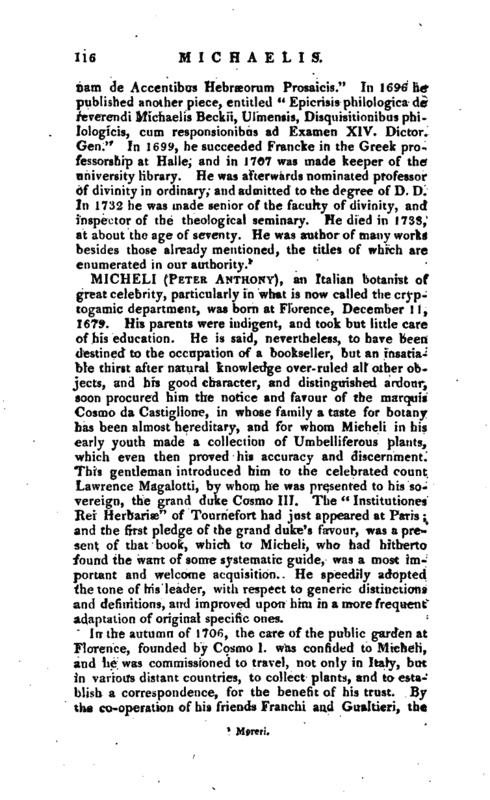 He is said, nevertheless, to have been destined to the occupation of a bookseller, but an insatiable thirst after natural knowledge over-ruled all other objects, and his good character, and distinguished ardour, soon procured him the notice and favour of the marquis Cosmo da Castiglione, in whose family a taste for botany has been almost hereditary, and for whom Micheli in his early youth made a collection of Umbelliferous plants, which even then proved his accuracy and discernment. This gentleman introduced him to the celebrated count Lawrence Magalotti, by whom he was presented to his sovereign, the grand duke Cosmo III. The “Institutiones Itei Herbanae” of Tournefort had just appeared at Paris; and the first pledge of the grand duke’s favour, was a present of that book, which to Micheli, who had hitherto found the want of some systematic guide, was a most important and welcome acquisition. He speedily adopted the tone of his leader, with respect to generic distinctions and definitions, and improved upon him in a more frequent adaptation of original specific ones. In the autumn of 1706, the care of the public garden at Florence, founded by Cosmo 1. was confided to Micheli, and he was commissioned to travel, not only in Italy, but in various distant countries, to collect plants, and to establish a correspondence, for the benefit of his trust. By the co-operation of his friends Franchi and Gualtieri, ^the | garden was enriched from the then more flourishing one at Pisa; and a botanical society was instituted at Florence in 1717, which greatly promoted the interests of the science. In the summer of that year, the great William Sherard, returning from Smyrna to England, visited Florence in his way, and formed a friendship with Micheli, that continued till his own decease in 172S. A frequent correspondence, and interchange of specimens, took place between them, as amply appears by the collections preserved at Oxford, and by the writings of Micheli. 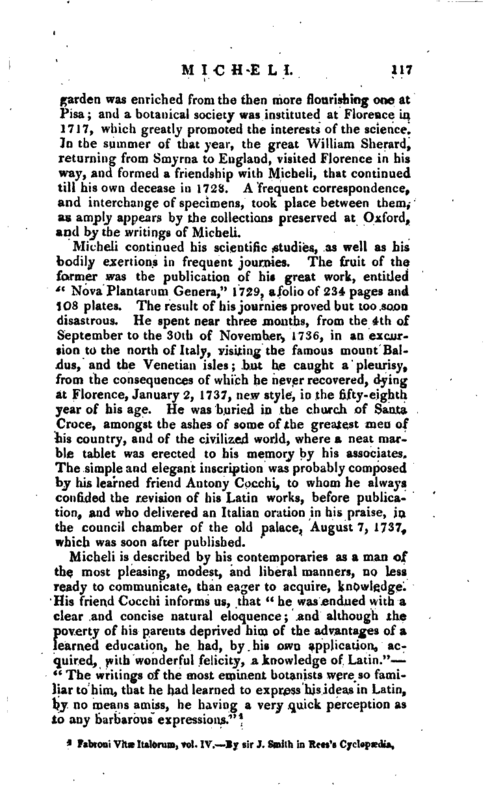 Micheli continued his scientific studies, as well as his bodily exertions in frequent journies. The fruit of the former was the publication of his great work, entitled “Nova Plantarum Genera,” 1729, a folio of 234 pages and 108 plates. The result o*f his journies proved but too soon disastrous. He spent near three months, from the 4th of September to the 30th of November, 1736, in an excursion to the north of Italy, visiting the famous mount Baldus, and the Venetian isles; but he caught a pleurisy, from the consequences of which he never recovered, dying at Florence, January 2, 1737, new style, in the fifty-eighth, year of his age. He was buried in the church of Santa Croce, amongst the ashes of some of the greatest men of his country, and of the civilized world, where a neat marble tablet was erected to his memory by his associates. The simple and elegant inscription was probably composed by his learned friend Antony Cocchi, to whom he always confided the revision of his Latin works, before publication, and who delivered an Italian oration in his praise, in the council chamber of the old palace, August 7, 1737, which was soon after published. 1 Fabroiu Vitae Italorum, vol. IV. 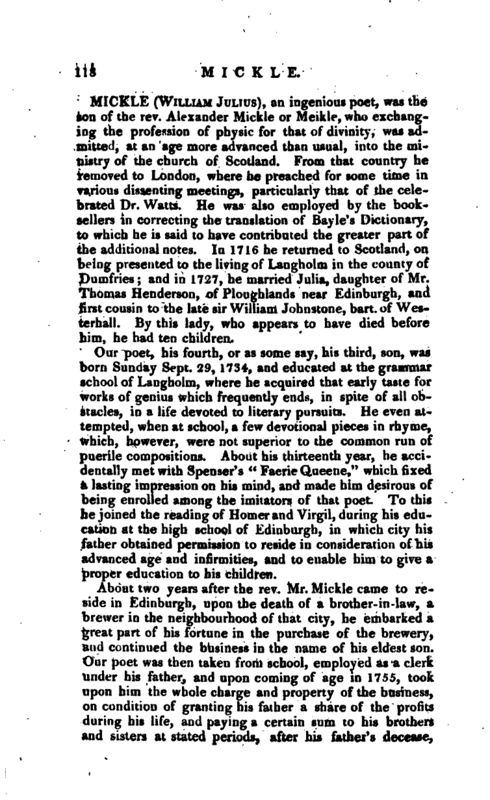 By sir J. Smith in Rees’s Cyclopædia.